High strength, impact resistant thermoplastic. Easy open guard permits relamping without removing guard. Porcelain socket clamp without switch. Screw in a light bulb and clamp the socket where needed. 150 watts/125 volt. Ball joint for easy positioning. Tough, no scratch clamp. Bulb not included. 6 ft. 18/2 SPT-2 cord. UL listed. Incandescent work light. Large grip handle. No-scratch hang hook. 6 foot 18/2 SJT cord. UL listed. Ball joint for easy positioning. Tough, no scratch clamp. Bulb not included. 6 ft. 18/2 SPT-2 cord. UL listed. Swing open guard. Sturdy 10" aluminum reflector with guard grill. Ball joint for easy positioning. Tough, no scratch clamp and hang hook. 300 watt bulb maximum, not included. 6 ft. 18/2 SVT-2 cord. Incandescent work light with 13 amp outlet and a tough metal cage. Heavy gauge 16/3 SJT cord. 13 amp outlet. UL listed. Features insulated porcelain sockets, heavy gauge aluminum reflectors and hang-up hooks. Bulb guards that snap on the reflector, two-conductor, polarized male plugs and a durable vinyl cord. Used for pig and chicken brooders or as a temporary heat source. 10" reflector diameter. 250 watts/125 volt. UL, cUL Listed. With bulb protector, sturdy anodized wire construction. Porcelain socket and clamp to hold the lamp in place. 150 watts/125 volt. Tempered glass lens with metal safety grill. All weather 3 foot, 18/3 SJTW cord with molded plug. Spare bulb included. Less outlet. Rugged heat-resistant housing stays cool even with short neck bulb. Flexible round orange vinyl jacket. 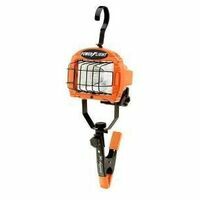 Dual hook system permits hanging the work light by either its guard or handle. Meets OSHA specifications for temporary lighting. 125 volt, use with 75 watt bulb maximum. 18/2 SJTW - A. UL Listed. Sleeved. Strong, vinyl coated spring clamp grips pipe, lumber and more. Aluminum 8-1/2" diameter reflector. Tough, heat resistant socket. Double swivel clamps with vinyl grips. Black cord. 150 watt/125 volt rating. UL, cUL Listed. 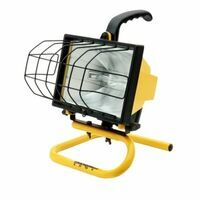 CCI Work Light, Series: Contractor, 120 V, 250 W, Halogen Lamp, 250 W Lamp, 1 Lamps, AC Source Power, 4000 lumens, 18/3 AWG Cord, 5 ft Cord Length, Clamp Mounting, Die Cast Metal, Powder Coated, Includes: Light, Clamp and Swivel Hook, cUL, UL Listed, For Construction Workers, Home Owners and Contractors Cooler bulb, safer to touch. Bulb included, lasts up to 7 years. Hang hook. 6 foot 18/2 SJT cord. UL listed. Similar amount of light to a 75 watt incandescent bulb but with daylight color (7000 Kelvin). 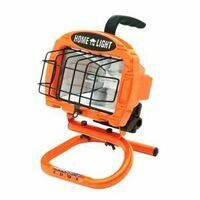 CCI Work Light, Portable, Series: Contractor, 120 V, 500 W, Halogen Lamp, 500 W Lamp, 1 Lamps, Corded Electric Power, 8000 lumens, 18/3 AWG Cord, 3 ft Cord Length, NEMA 5-15P Enclosure, 14 in Overall Height, Die Cast Metal, Powder Coated, Orange, Includes: Floor Stand With Handle, cUL, UL Listed, For Large Residential Construction Projects Tough, almost unbreakable housing protects bulb. Bulb included, lasts up to 7 years. Cooler bulb, safer to touch. 12 amp grounded outlet. Spot light top. Hang it, stand it or hold it. Similar amount of light to a 75 watt incandescent bulb but with daylight color (7000 Kelvin). 6 foot, 16/3 SJT cord. UL listed. Aluminum 8-1/2" diameter reflector. Protective vinyl covered grips, full swivel head. Polarized. UL, cUL Listed. Trouble light with 6 foot 16/3 SJTW cord and 120 volt outlet. cULus Listed. 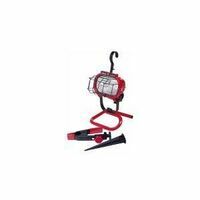 CCI Work Light, 4-in-1, Combo, Series: Pro, 250 W, Halogen Lamp, 250 W Lamp, 1 Lamps, 4000 lumens, Wide Angle Lens, 18/3 AWG Cord, 3 ft Cord Length, Clamp Mounting, Die Cast Metal, Powder Coated, Red, Includes: Weatherproof Switch, cUL, UL Listed, For Commercial/Industrial and Residential Applications Shatter-resistant polycarbonate lens. Durable ABS LED housing. Magnet on back and bottom. 120 degree beam spread. 2-way charging, AC and DC. 3 watt work light, 1.3 watt spotlight. Both have 5-1/2 hour runtime, 100 lumens, 80 CRI and 4000K. Patented dual hook system, hang by the guard or handle. Heat resistant housing stays cool even with short neck bulbs. Round flexible vinyl jacket. Meets OSHA specifications for temporary lighting. UL rated for 75 watt maximum bulbs. UL Listed. Orange cord. Sleeved. Swivel hook, shatter-resistant polycarbonate lens, 15 amp U grounded outlet, Durable rubberized casing. Powered by 6 foot AC cord. SJT 18/3 6 ft, (110v to 240v). Uses only 6 watts. 400 lumens, 80 CRI, 5000K, 120 degree beam width. Instant on switch. Durable plastic construction with polycarbonate lens. Cushioned grip. Swivel hook rotates 360 degrees. 15', 18 gauge cord. 120 volts.